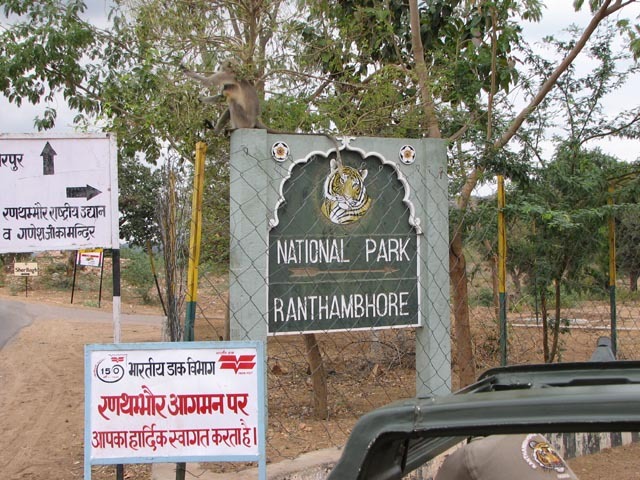 On our recent visit to India we visited Ranthambhore National Park. 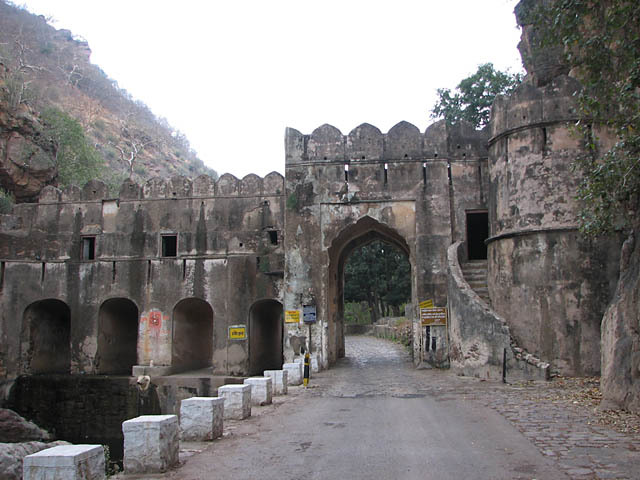 The park is located near the town of Sawai Madhopur in Rajasthan. 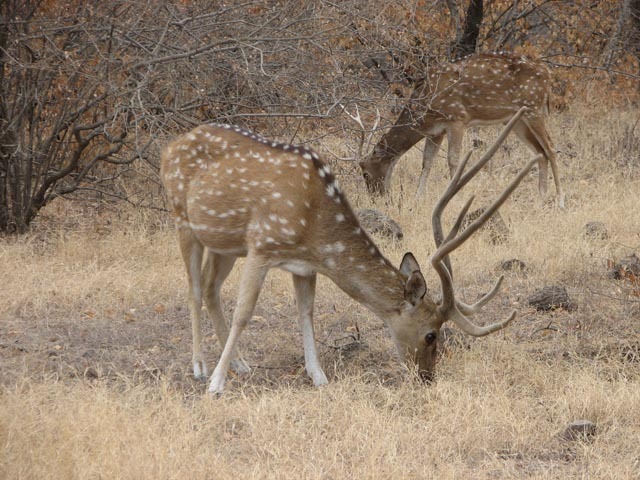 We stayed at the Tiger Safari Resort and on our three safaris we saw many animals, including tiger, leopard, spotted deer, crocodile and more. 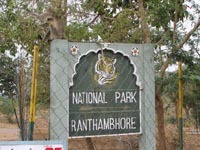 Safaris in Ranthambhore are either by jeep or canter. A jeep can hold four passengers, plus the driver and guide. A canter can hold up to 20 passengers plus the driver and guide. 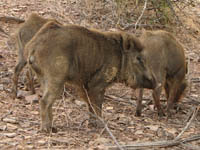 There are two safaris each day, the timings of which depend on the time of year. 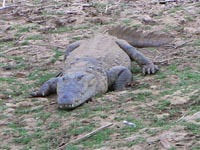 Safaris last approximately three hours. 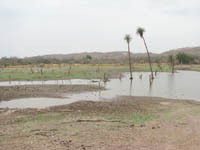 Our first safari was on the afternoon of 9 March 2006. 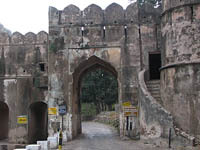 We had arrived in Sawai Madhopur on the afternoon train and made it to our resort just in time, much to the hotel’s great relief. 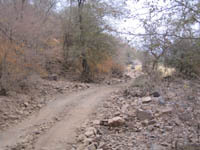 On this safari our jeep drove route R7. The below photos show: a sign leading to the park; the entrance gate of the park; our jeep at the checkpoint in the middle of the park; and a road in the park. Our guide on this safari was Satish. 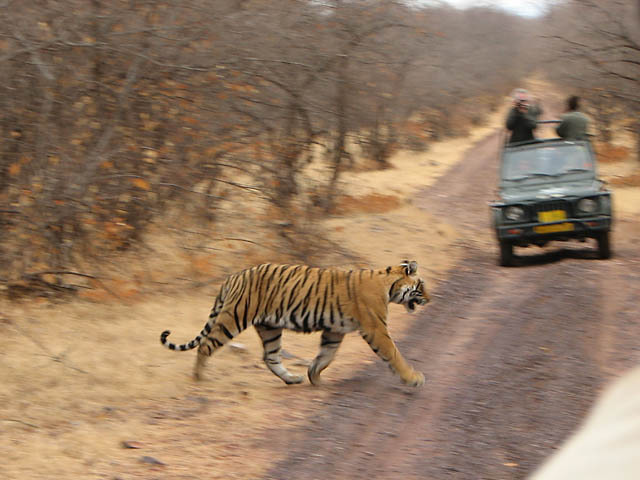 We joined a young American couple who had been lucky enough to see a tiger on that morning’s safari, at a distance. 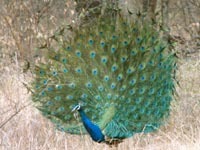 Satish was great and pointed out a lot of wildlife we would not have seen otherwise. 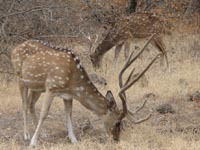 During the trip the other couple told Satish that out of the four guides they had so far, they liked Satish the best. That was nice for us to hear too. Although we were not lucky enough to see a tiger, we were very happy with the safari and found the park to be quite lovely. 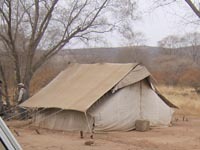 We were looking forward to our other two safaris the next day. 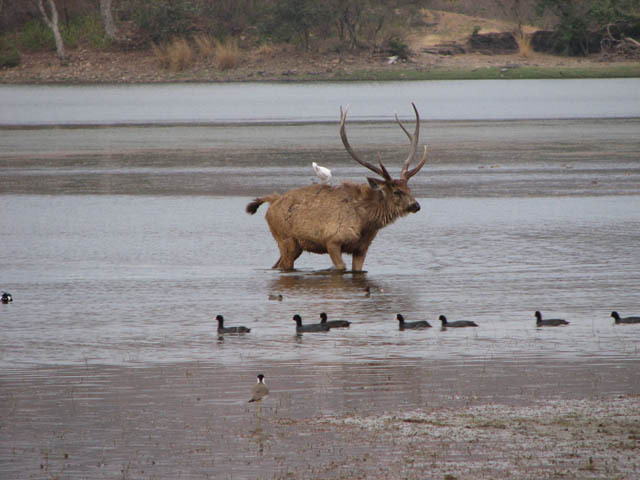 The below photos show some of the other animals we saw: Marsh Crocodile; Grey Langur; Sambar (male and female); Chital; Indian Peafowl. The morning of 10 March was overcast and threatened to rain the entire time. 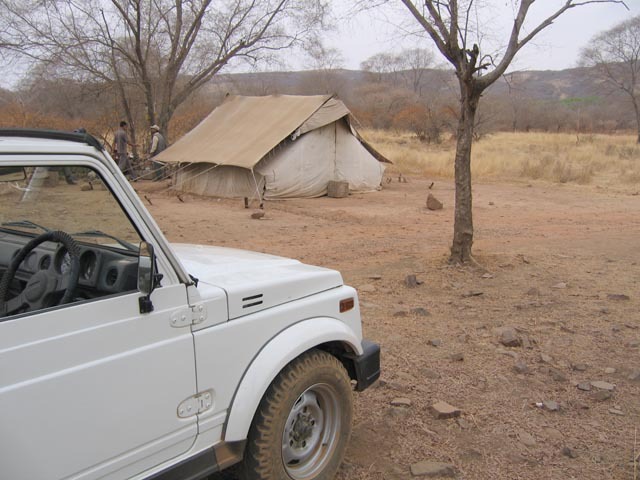 Our hotel offered us blankets, which we accepted gratefully – in the open jeep it was quite cold. 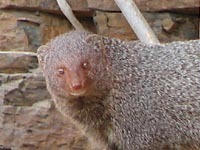 We were joined by a British couple who were on their first safari. Our car was assigned to drive route R4, but we later learned that our guide and driver were “illegally” doing a custom route. We spent a lot of this safari racing around trying to find tigers. 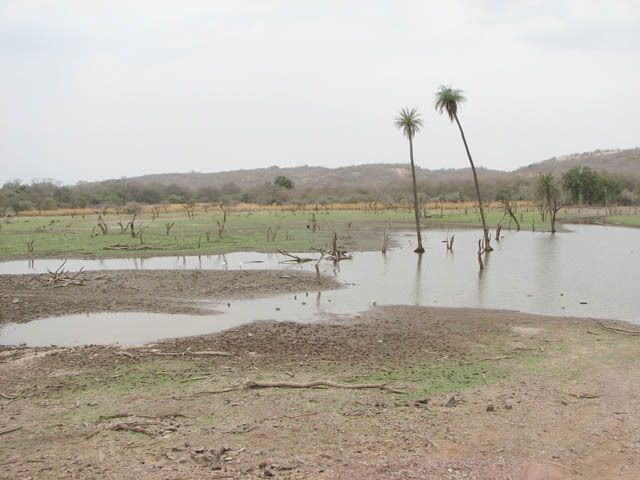 As a result we did not stop at any watering holes as we had on the previous safari. We did, however, see some tigers. 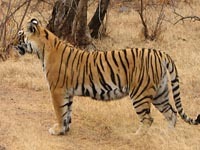 There had not been any tigers seen in the park for a few days prior to the distant sighting made on the 9th. The tigers typically hang out in a couple of areas and this is where the guides try to concentrate the safari. 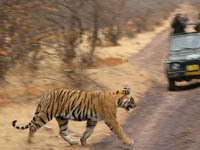 We were among the first jeeps to arrive at a particular known tiger hangout. 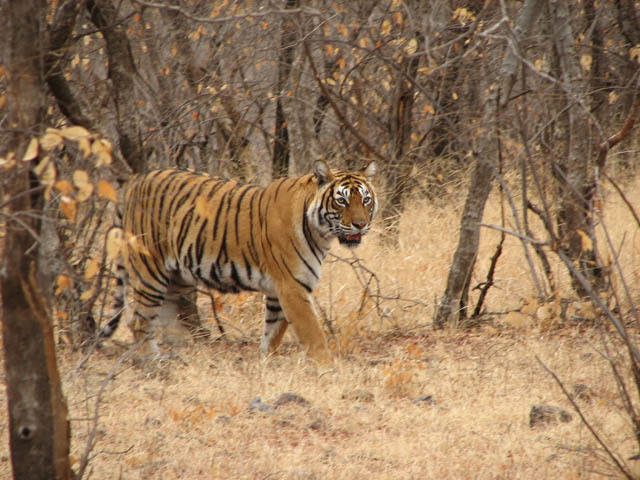 After waiting a short time, we spotted a tiger. 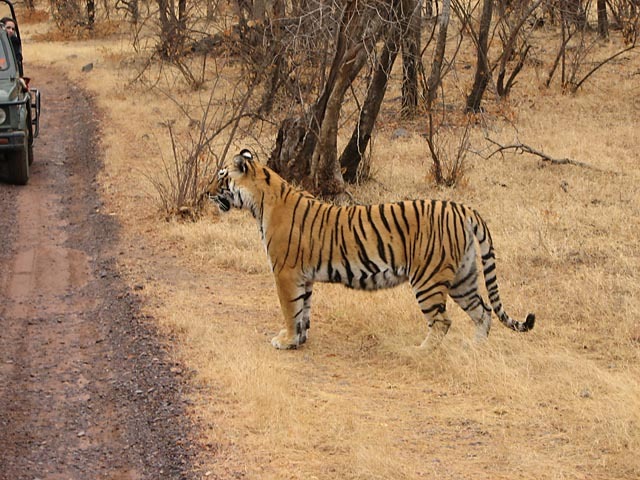 We were extremely lucky because she walked right in front of our jeep, about 5 meters away from us. Her male cub followed a short time after and we continued to wait, hoping her other cub would also cross, but alas she did not. 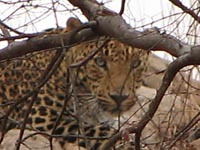 On the same safari we saw another seldom-seen species, a leopard. This was spotted by a passenger in another jeep and we stopped to see what they had found. 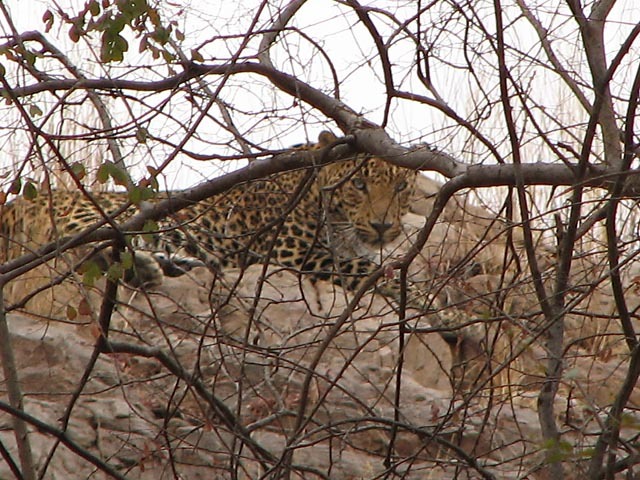 I think we were the luckiest jeep that day because we were the only ones to see both the tigers and the leopard. 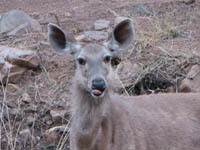 In the afternoon we were again lucky because we had Satish again for our guide, and we were the only ones in our jeep. The guides are assigned randomly so we were extremely fortunate to have Satish a second time. 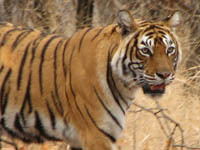 We told him that we had seen the tigers in the morning, and that we would be happy to see other wildlife and birds. 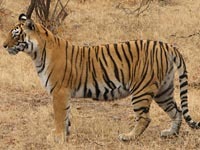 This was a great arrangement as Satish was happy to have passengers who were interested in more than just tigers. 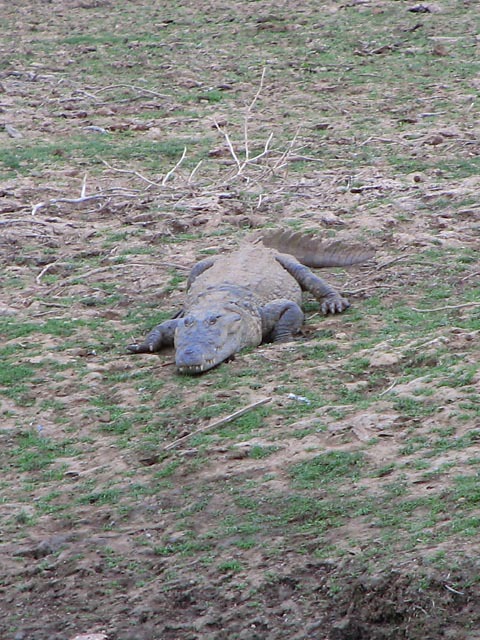 Seeing the leopard and tiger were the best sightings, but this last safari was our favorite. 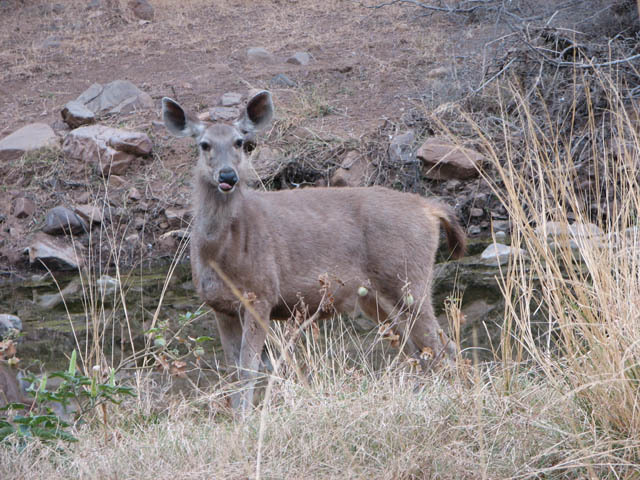 It was quite relaxed and we made several stops by watering holes and other animal hangouts. 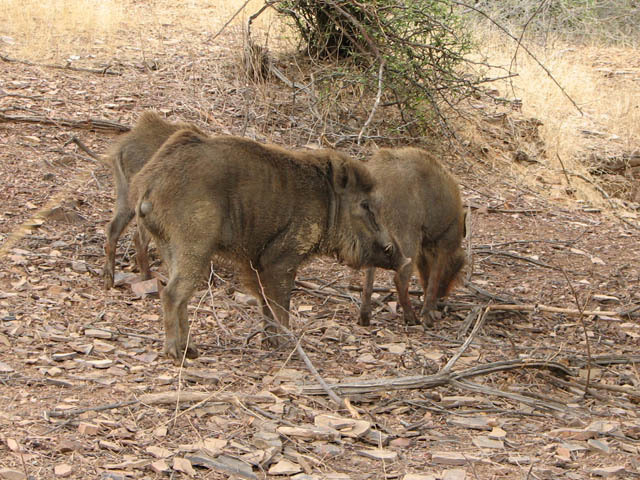 The below photos show: the Leopard we saw; Indian Grey Mongoose; a watering hole in the park; and Wild Boar. 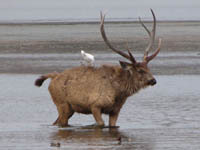 Over all three safaris we saw the following species: Marsh Crocodile; Indian Grey Mongoose; Nilgai; Chital; Sambar; Gray Langur; Bengal Tiger; Wild Boar; Leopard; Rufous Treepie; Black-Winged Kite; White-Breasted Kingfisher; Jungle Babbler; Common Myna; Cattle Egret; Red-Wattled Lapwing; Peafowl; Indian Darter; Rose-Ringed Parakeet; Osprey; Red-Vented Bulbul; Oriental Honey Buzzard; Black Drongo; Painted Stork; Black-Headed Ibis; Ruddy Shelduck; Crested Serpent Eagle; Collared Scops Owl; Spotted Owlet; and others. 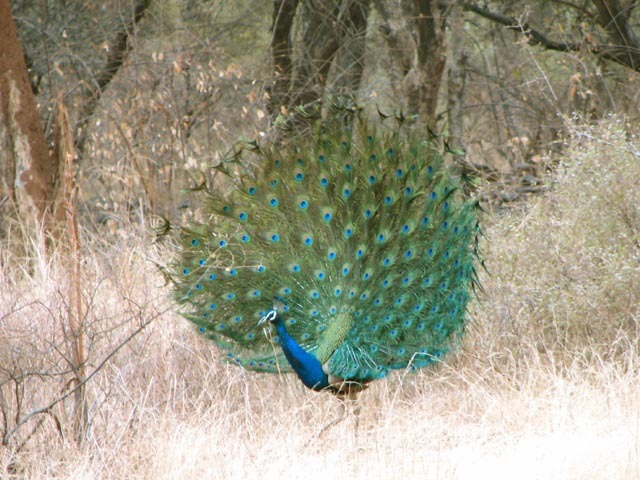 Ranthambhore National Park may be known for its tigers, but the park has a lot more to offer those seeking wildlife in India. 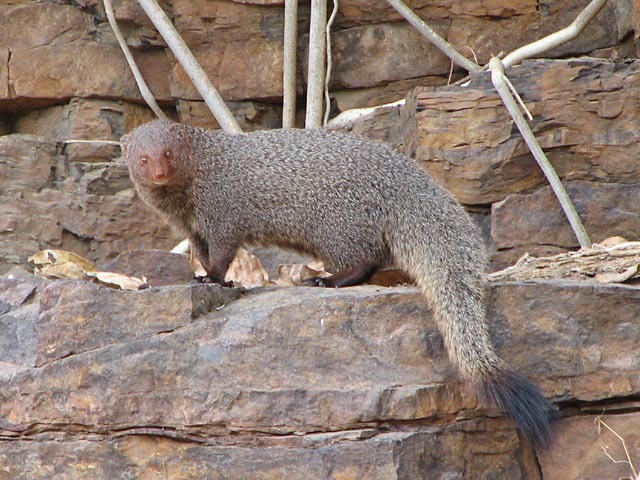 This entry was posted on Saturday, April 22nd, 2006 at 4:44 pm CET and is filed under Nature, Travel	with tags . You can follow any responses to this entry through the RSS 2.0 feed. You can leave a response, or trackback from your own site. hi, thanks for giving my name on web site. 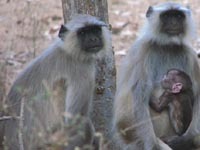 we r all fine here and pray same for u. when u r coming to ranthambhore please let me know, weather r very good now. good rain ( man soon), all lake & dam r full. 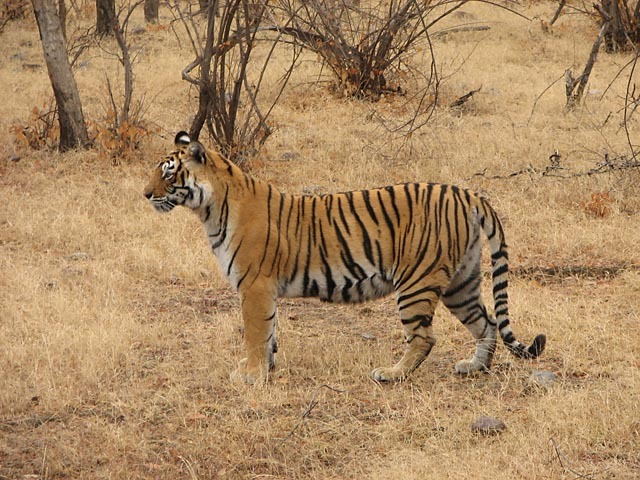 two tiger sifted to sariska from ranthambhore park.